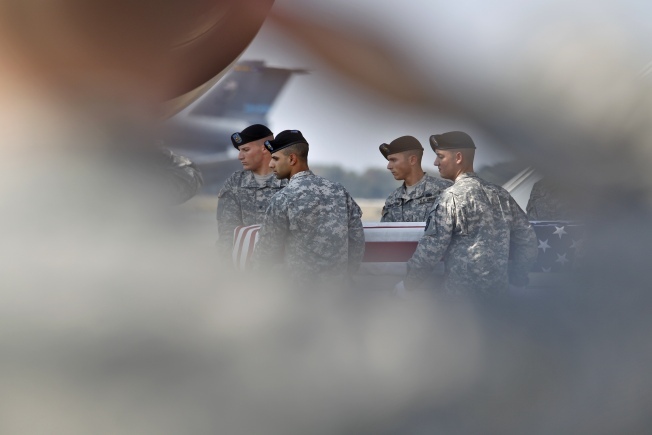 An Army carry team carries the transfer case containing the remains of Army Pfc. John Carrillo of Stockton, Calif., upon arrival at Dover Air Force Base, Del. on Saturday, Sept. 25, 2010. The Department of Defense announced the death of Army Pfc. John Carrillo who was supporting Operation New Dawn in Iraq. WASHINGTON - A U.S. soldier is in custody in connection with the shooting deaths of two fellow service members in Iraq, the Stockton Record reported Monday. Spc. Neftaly Platero is in pre-trial confinement as authorities investigate the deaths of Spc. John Carrillo Jr., 20, of Stockton, Calif., and Pfc. Gebrah P. Noonan, 26, of Watertown, Conn., the newspaper said. Carrillo and Noonan died Friday of injuries suffered a day earlier in Fallujah, Iraq, the Defense Department said in a press release. A third service member was injured. No further details were released on the shooting. “Our condolences go out to the families of those service members whose lives were lost. We are saddened by this tragic incident,” said Brig. Gen. Jeffrey Buchanan said in a press release, according to the Record. The victims were assigned to 3rd Battalion, 15th Infantry Regiment, 4th Infantry Brigade Combat Team, 3rd Infantry Division, Fort Stewart, Ga.